Three adjectives that describe you: Observant, trustworthy and reliable. Favorite Activities: I love playing city league flag football and softball. I love to mime and do drama skits at church. I love to read and take walks in the park or just be outside. I love to fish and hunt and shoot guns at the gun range. I love love love board games, especially Monopoly. What do you think will be the most difficult part about living inside the “Big Brother” house? Nothing except being away from my church on Sundays. Strategy for winning “Big Brother”: I will use intelligence without showing I’m as smart as I am and I will befriend people to get to know them and use their strengths and weaknesses against them - no matter how or what I have to use to get what I want to make my plan work. 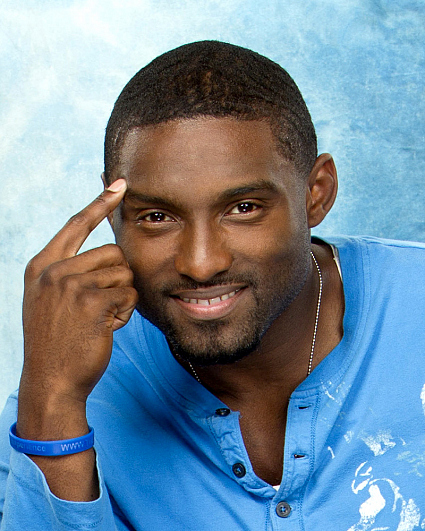 Which past “Big Brother” cast member did you like most or least? Jason from season 2 because he was representing for the men and played a great game to the end. I didn’t like Lisa from season 3. What are you afraid of? I hate spiders and big birds. What is the accomplishment you are most proud of? I was the first person in my immediate family to graduate from college after receiving a full athletic scholarship. Finish this sentence: My life’s motto is…to conduct myself in a manner that is worthy of “Christ” and to live abundantly and share it with others. What would you take into the house and why? 1. My Bible, because it’s my guide on how to live and love 2. My head phones and iPod because I have to have my music and 3. My XBox because it keeps me competitive and calms me. What would you do if “Big Brother” made you famous? Man, I would share it all on some level with the less fortunate and my family because I’m tired of them struggling. We would get some businesses started. Plus, I finally want my mom and sisters to ride a plane and go somewhere beautiful where there are no mosquitoes.